A pair of stainless steel boarding ladder removable brackets that allow you to remove a boat boarding ladder from the Removable Boarding Ladder Fixing Plates that can be located around your boat. These boat boarding ladder brackets attach to many ladders using the horizontal bolt and Nyloc nut. The ladder feet have two fixing holes so that you can permanently fix a ladder to the deck of your boat. 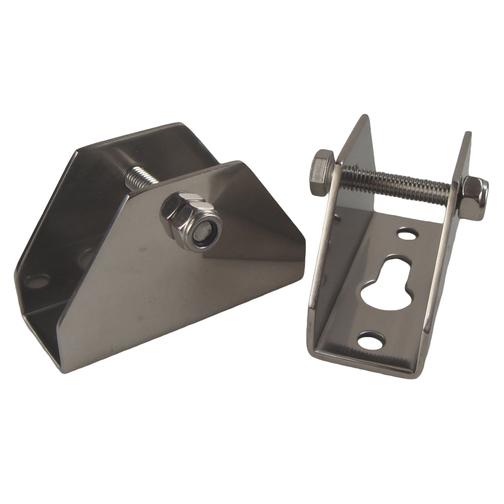 Alternatively they can be used with the Removable Boarding Ladder Fixing Plates, that can be installed at various locations on your boat, where the bracket feet simply locate on to the fixing plates and lock into place. Making it easy to remove for storage, or move a boarding ladder around the boat for different boarding positions.